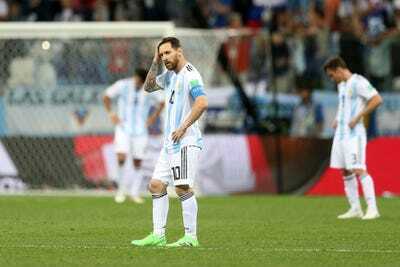 Argentina suffered a shock 3-0 loss against Croatia in a 2018 FIFA World Cup game on Thursday. Wilfredo Caballero’s goalkeeping howler led to Croatia’s opening goal, but Lionel Messi – Argentina’s captain – struggled to make an impact. In fact, three key statistics indicate how truly awful Messi was. If Messi, considered one of the two top soccer players on the planet, fails to find his goal-scoring boots in the next game, Argentina is heading toward an embarrassing World Cup exit. One of the biggest shocks of the 2018 FIFA World Cup so far is the poor performance of some of the heavyweight nations. After a disappointing 1-1 draw against Iceland and a humiliating 3-0 loss to Croatia, Argentina – touted before the tournament as an outside favourite for the title – deservedly finds itself in that bracket, and punctuating each underwhelming game is a truly awful display by Lionel Messi. Most recently, Messi failed to deliver Thursday, when his country needed him most. Yes, it was goalkeeper Wilfredo Caballero’s costly error that attracted negative headlines after the defeat. His mishit allowed Croatian winger Ante Rebic to volley home an easy goal in the 53rd minute – the first of Croatia’s three goals. But Messi is a shadow of himself – and three key statistics indicate he performed as almost half the player he normally is. Against Croatia, Messi had only 49 touches, according to the Spanish newspaper Marca. This pales in comparison with how frequently he was on the ball throughout the 2017-2018 season with FC Barcelona, where he averaged 77.4 touches on the ball each game. The more touches you have, the more likely it is you will have an impact on a match. As Messi wasn’t on the ball as often as he has been in the past, he wasn’t able to weave his customary magic. In fact, he attempted only 32 passes – and of those passes, only 24 found a teammate. This, again, is woeful compared with his recent form. In the 2017-2018 season he attempted 52.7 passes a game, completing 43.12. Perhaps the most damning statistic of all is that Messi, who scored 34 La Liga goals from 32 starts last season, attempted only a single shot on goal Thursday – and that lonely shot did not even test Croatia goalkeeper Danijel Subasic. Argentina now has only one Group D point from a possible six, as does Iceland, which plays Nigeria on Friday. It is way behind the table-topping Croatia (six points) and must defeat Nigeria (no points) on Tuesday if it is to have any hope of progressing into the knockout stages. But if Messi, Argentina’s captain, cannot find his goal-scoring boots by then, the team is likely to suffer an embarrassing World Cup exit.